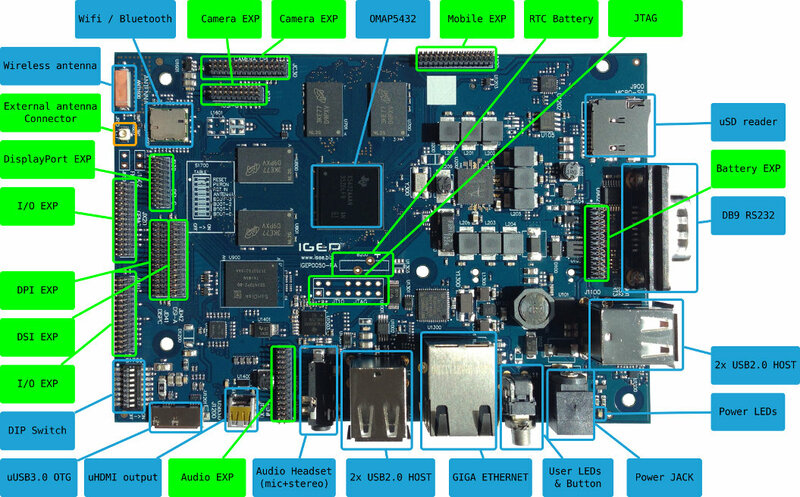 ISEE IGEPv5 development board announced in October 2013, and powered by Texas Instrument OMAP5432 dual core Cortex A15 + dual core Cortex M4 SoC, POWERVR SGX544MP2 and Vivante GC320 GPUs is now available for as low as 149 Euros. There are two versions: “IGEPv5 OMAP5432 Communication Edition” for hobbyists with limited support, and “IGEPv5 OMAP5432″ directly supported by ISEE. There’s also “IGEPv5 Custom Design” if you have specific requirements for your product. So the community edition has an SoC clocked at a lower speed, features only 1 GB DDR3, lacks eMMC flash, Wi-Fi and Bluetooth connectivity, and can only operate in commercial temperature range. 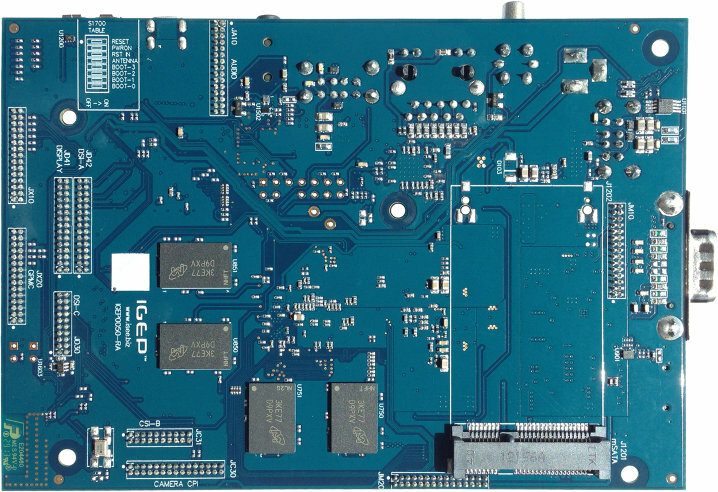 Like its big brother however, it does feature mSATA 2.0, Gb Ethernet, and USB 3.0 which are rarely found in low cost ARM Linux development boards. IGEPv5 Community Edition is only supported by the IGEP Coomunity, ISEE is the manufacturer and don’t provide support for this product. This product don’t include any Longevity program, all ISEE products include a longevity warranty it means that every product must be in the market for 10-15 years. All hardware sold by ISEE include a extense warranty including software, support or hardware modifications, this product is NOT included and only the community support this product. This product is Open hardware, no warranty exist in any documentation, software, this product cannot be used in any Industrial application. This product is only for study, learn, prototyping … its not sold for any REAL final application. ISEE offers professional support services & design (for free), this product is not covered by these services. The company however does mention a product called “IGEPv5 little” with the exact same hardware as “IGEPv5 CE” and without the limitations listed above (e.g. ISEE support, usable in retail or industrial products…), but I could not find details at this time. The company provides support for Ubuntu, Open Embedded, Android as well as others operating systems via IGEP Community Wiki, which currently includes a quick start guide and a link to IGEPv5 hardware reference manual. You can also have a look at the git repository for Linux, U-boot, and more, and access IGEPv5 CE support forum for any questions. You could order IGEPv5 OMAP5432 Community Edition (IGEP0050-RB20) for 149 Euros, and/or visit IGEPv5 OMAP5432 CE and IGEPv5 OMAP5432 product pages for more details.